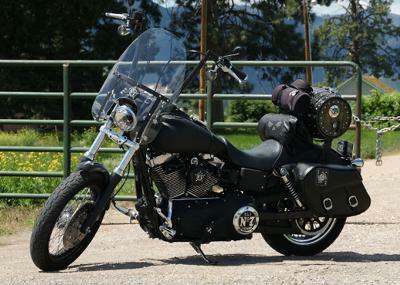 Originally, it was a Denim Black '07 Harley Davidson Street Bob. Upon getting it home on the day I bought it, I made the comment that there were 7 miles on the odometer. Someone remarked that a lot of people name their bikes, and that I should name mine Old No. 7. That spring, I mounted a Jack Daniels flask on the gas tank, and decided that was going to be it. I was wrong. 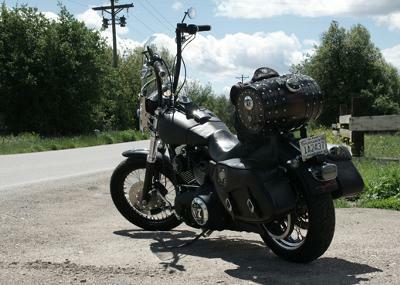 One thing lead to another, and I got the idea to mount an old whiskey barrel above the rear fender, using it as both storage and a back rest. It was at that point I decided I was going to fill it out with Jack Daniels parts and accessories as much as tastefully possible. One rule however, no paint jobs. Only tactile and functional accessories allowed. To date, I have 40 (give or take a couple) references to the JD brand, some of them functional (lighter attached, flasks mounted here and there, usually full, metal shot glasses in a leather carrying case above the tail light, etc), but all of them 3 dimensional.